Back cover blurb: What magic is this? You follow the hidden creek towards a long-forgotten house. They call it Keepsake, a place full of wonder ... and danger. Locked inside the crumbling elegance of its walls lies the story of the Butterfly Summer, a story you've been waiting all your life to hear. This house is Nina Parr's birthright. It holds the truth about her family - and a chance to put everything right at last. Nina Parr has never known her Father, he was killed on an expedition when she was a baby. But that's okay, she has a loving Mother, Deliah and Stepfather Malc. She doesn't need anyone else. When Nina meets a strange old lady in the London Library who she has never seen before in her life. Yet the lady professes to know who she is and to have known her Father, Nina is left seriously confused. Especially when she is told to ask her Father about Keepsake. But her Father is dead. As Nina looks for answers to these questions, what she discovers will leave her questioning if her whole life has been a lie. Sebastian, Nina's ex-husband is on hand to help Nina through her confusion, but then he professes that he still loves her, and Nina's world is turned upside down once again. 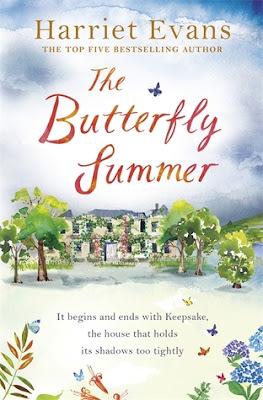 In the meantime, we are told a different story, the one of 'the Butterfly Summer' from the perspective of Teddy who we learn to be Nina's Grandmother. As the two stories run alongside each other, it is clear that the past influences the future, but we are not entirely certain how or why. This novel drip feeds us the reader with tantalising snippets of information, keeping us wondering until its conclusion. It's style might perhaps not be everyone's cup of tea, and I did find some parts of it slower than others (hence the 3.5 stars) but it is a wonderful novel nonetheless and is bound to be a surefire summer hit. The Butterfly Summer is available from 19 May 2016.